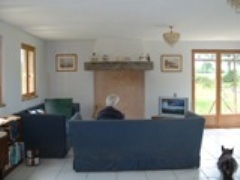 3 bedroom house to rent as a gite for your holiday or available for winter let. we are always happy to welcome well behaved pets. 12K from the bay of Mont st Michel where you can walk your dogs all year round on the beach. The house has 3 double beds, 1 en suite. 1 family bathroom. large fully equiped kitchen, lounge with beautiful view across the fields. downstairs WC. English TV. We do have internet access. Full central heating. large garden with parking. Stunningly beautiful sunsets and no light pollution to spoil the night sky. Your stay at Epona will be full of magic, from the ponies that that live in the fields adjoining the house, to the hen with her chicks that regularly stroll through the garden. please call us on 0033233618841 or e mail [email protected] for more details. Please remember the income we generate pays to run the refuge. We have been very fortunate to have 2 very well known film producers staying with us , even more fortunate for us, they have made us an advert free of charge, so to you both a big Thank-you!.